If your business is interested in hiring a refugee, or if you are interested in volunteering with Bridge Refugee Services, contact Marina Peshterianu at 423-954-1911 or mpeshterianu@bridgerefugees.org, or Valerie Brite at 423-207-2538 or volunteermanager@bridgerefugees.org. Mad Priest is located at 1900 Broad St., next to Koch’s Bakery. Find out about the opening and hours by calling 423-724-7654. For more information or to purchase a bag of coffee online, visit madpriestcoffee.com. Two months ago, Michael Rice's friend confided in him on Facebook. "I miss to marry," he explained in broken English, which is not his first language. But the meaning behind the sentiment was much more profound. The friend is a refugee, one of many whom Rice has met through his time working in coffee shops across India, a country which takes in thousands of Hindu and Sikh refugees from Pakistan and Afghanistan. "I didn't know what to respond," Rice recalls, explaining that his friend meant he wished he had a wife and family. "He wants a normal life. He wants a kid. He wants a wife who loves him. And there I was, complaining that my daughter hadn't slept well the night before. But I have her. And that's the moment that was the most striking to me. They [refugees] aren't vulnerable often, so for him to even say that is a big deal, but only a small glimpse of what it's like to not have a home, to not have a normal life." 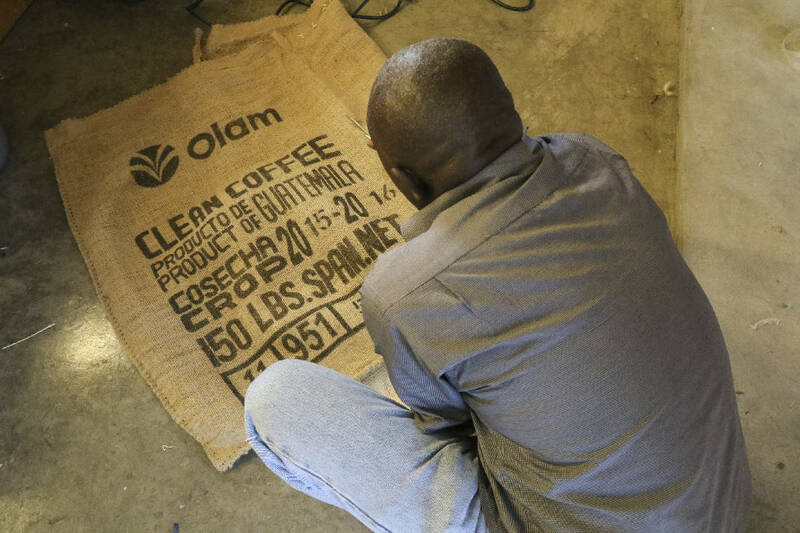 Moments like that are what drives Rice to go beyond simply lending an ear; what moved him a year ago to embark on a conceptual business plan coupling coffee roasting with refugee outreach, a plan that many told him was crazy. A year later, he stands in his new Broad Street coffee roaster, Mad Priest, working diligently on the equipment he was finally able to purchase and install after months of roasting on a sample roaster which made only 1-pound batches. "It's really only meant to be used for tastings," he explains of the tiny roaster he brought back with him from his time living and working in India. He still has it in his shop, though his new artisan model, the San Franciscan SF-6, makes six times what the old machine did. That still isn't large-scale, he acknowledges, but as a new business — especially one with his purpose in mind — he is willing to sacrifice quantity and convenience for quality. "CRAFT excellent coffee. EDUCATE the curious. CHAMPION the displaced." reads Rice's business statement, emblazoned across the top of his website. It was formed from the three experiences which propelled him to his current reality. Inspiration for the company's name came from The Count of Monte Cristo, referencing the "mad priest" who inspires the story's protagonist as he is on the brink of giving up, giving him the necessary skills to not only survive, but thrive. "The Mad Priest is a fictional character that embodies the fight for justice, freedom, and opportunity. And as a company, we are striving to do just that," Rice says on his site. "But instead of wrongly-accused fictional Frenchmen, we champion real-life people displaced by war, disaster, and tragedy." Working closely with local Bridge Refugee Services, a nonprofit which helps approximately 100 refugees relocate to Chattanooga from around the world each year, Rice worked to make sure his business would be accommodating to his desired employees. Being located on a bus line for easy access, for instance, was something he says he would not have thought of without Bridge's help. Last month, Rice hired his first employee, a refugee from northeastern Africa. The refugee, whose name and identity must be protected, still has family there, he says — 14 brothers and sisters, to be exact — so he doesn't want to be more specific about the war that caused him to flee his homeland with his wife. His sons have never known their parents' home; never experienced the reasons for their parents' need for anonymity even though they are now oceans away from the violence in their homeland. All three were born during the 10 years the family spent in Egypt awaiting a permanent placement. But Chattanooga is home now, the father says with a quiet certainty, working under Rice's tutelage in the Broad Street shop. He learned a little English in his university studies years ago, but being in America is different. "Hard, but good," he says — especially for his three boys. Articulating is still hard, but his face beams with pride and joy as he searches for the word "son." He hopes to have a daughter some day, he confides, a thought fresh on his mind after meeting his boss's two little girls. "Insha'Allah," he says. God willing. But he is hopeful. In Chattanooga, he can be hopeful. What were once dreams now seem tangible. In spite of his currently limited English, he could manage a coffee shop one day, Rice says, in awe of his work ethic and spirit. Or, should he eventually want to switch careers, Rice says he's open to helping him connect with other nonprofits and being a reference. For now, he is simply happy to be in America, and to be Rice's first employee, he says. The coffee roasting business is one Rice and his wife Cherita initially dreamed of in India, after moving there in 2011 first as teachers, then as the leaders of a small English language school in a small village north of Delhi. "That was never the end goal, but it was a way that we could see if we liked being abroad and getting our foot in the door," Rice says of his stint teaching English. "It was a really great lesson in business that I never would have had otherwise; being the accountant, being in charge of this school's growth and development." After a short return to the U.S. for the birth of their first daughter, Miriam, the Rices returned to India to follow their passion for coffee and meaningful experiences. They helped set up and open coffee shops — then a relatively new trend in India — across the northern and western parts of the country. It was in those shops Rice first experienced the depths of the issues that plagued many of the country's refugee and asylum-seeking population — the largest in South Asia. "We were really, originally there to help these Indians learn about coffee, but I ended up spending all of my time with these guys from Iraq, from Syria, from Iran, because they were there at the shops all the time and they had such amazing stories," he says. "They shared their struggles. Not having a place to call home — hearing that really impacted my life. And those stories are growing." The struggle is about much more than his Facebook friend who dreams of getting married, of having a family, of a "normal" life. It's about leaving behind a home, family members, friends and a life out of desperation, only to face continuous obstacles that many do not understand, says Rice. As Rice's coffee shops grew, so did the depths of his connections with friends from across the Middle East, and those relationships had a profound impact on his outlook on life. "One day [a friend] came into the shop and I could just tell he was really distressed," Rice recalls. " Someone in his family had been shot. And all of this was while he was trying to get into a school but admissions was giving him hell, he was having visa issues — and that alone could be stressful enough — and then he found out a family member had been shot. "I didn't even know what to say to that. I thought, 'Oh, I got mad today because someone cut me off [in traffic].' And a week later, he moved away and I never saw him again. I never found out what happened." Though that conversation happened nearly two years ago, Rice says he still thinks of it often. Conversations such as that were a driving factor in his business model's focus on hiring refugees. "Everyone should embrace grief, loss, life. And by embracing it here, we aren't just helping these people. We're embracing diversity of life," he says. As for Mad Priest's product itself, Rice works with Olam, a specialty coffee importer and exporter, to get his coffee beans. The business features beans from around the world, but focuses on beans which can also "educate the curious" about the economic and humanitarian needs of the countries on the label. "What that means, for example, is we're more likely to have a Colombian than a Peru," Rice explains, referencing Columbia's current economic state, which relies heavily on exporting products like coffee, while the country works toward a peace treaty between politicians and rebels. Rice says right now he is particularly excited about a Yemeni coffee which will be available as his shop opens its doors to the public for the first time this month. "Yemen, especially right now being in a civil war, needs that industry," he says. "Any coffee purchase from that region, because it's so small, is hugely beneficial to their economy and the survival of the people there. And hopefully, even though it's a little bit more expensive, people will buy it. I think they will. "Because it's not just the cup of coffee, it's their story."